Another chance to see me out in public, if you’re in Vancouver! 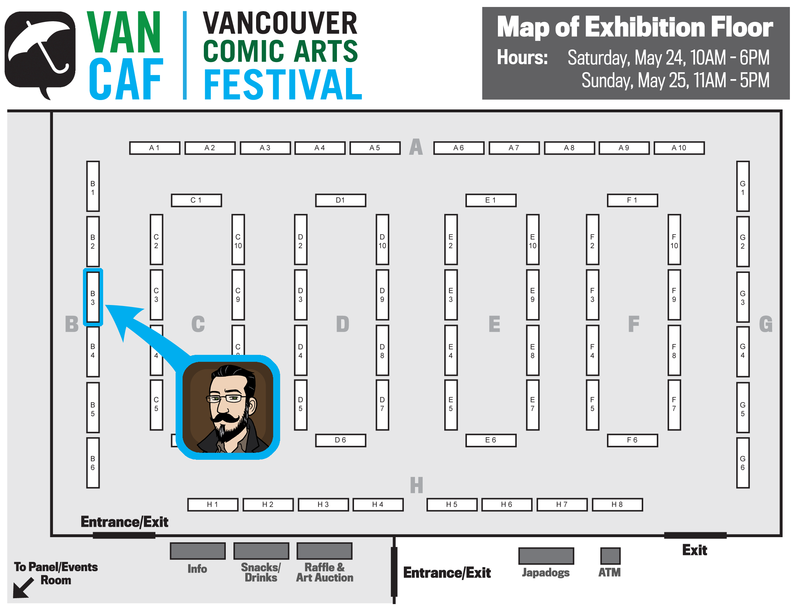 The VANCOUVER COMIC ARTS FESTIVAL (aka VanCAF) is this weekend, May 25-26, at the Roundhouse Community Arts & Recreation Centre in the Yaletown district of Vancouver, BC, Canada. This a very good show that focusses almost entirely on creator-owned comics and the creators themselves. And best of all: it’s FREE to attend! So wander on down to the Roundhouse and pop in for a look around. I’ll be there (Table B-3) selling my comics, original artwork and my newest sketchbook, “RACCOONS AND HUMANS AND BEARS, OH MY!” I might even have a handful of prints of the BEER ROBOT drawing I did the other month. Featuring Aaron Diaz, Kadi Fedoruk, Tyson Hesse & Steve Rolston. This panel, featuring talented and experienced character designers, will demonstrate some of the core concepts of designing a character–from a purely aesthetic viewpoint to the rich imaginings of character-driven details. Learn how to create characters of different body and facial builds while still retaining strong cartooning ideals. Hosted by Ian Boothby & David Dedrick and featuring Steve Rolston. SNEAKY DRAGON, Vancouver’s tied for 3rd favourite podcast, returns to VanCAF with a live show with guest Steve Rolston (Queen and Country, Ghost Projekt, Pounded and Degrassi: Extra Credit). Join hosts Ian Boothby (Eisner winning writer of The Simpsons and Futurama Comics) and David Dedrick (host of the Completely Beatles podcast) as they unlock the Secret of the Mummy’s Curse! Or just joke around about comics, either’s good. Beat Route Magazine posted an nice little article about VanCAF after talking to myself and fellow comic creator Sam Logan.